If you want to understand the basics of Chinese food policy, in particular in relation with foreign products, study this post. Developments in this business have been literally dramatic, and it is directly related to the most precious item of the majority of adult Chinese: their only child. A synopsis of what had happened from 2008 up to the present day. In the year of the first Chinese Olympics it was discovered that several brands of domestic infant formulae contained melamine, a compound that make the protein content of milk appear higher in the standard tests as conducted by dairy companies. It caused about 300,000 babies to get seriously ill, with a small number of deaths. As a result, the market share of the domestic brands dropped even lower that it already was at that time. Foreign brands believed that a Golden Age had come, in which they could virtually set the market price of formulae in China. European and American brands increased their prices almost every couple of months, without naming a valid reason. Chinese consumers were so eager to get their hands on foreign products, that Chinese on foreign trips were asked by the relatives to buy up any formulae they could get their hands on, as products there were much cheaper than in Chinese supermarkets. In countries like the UK or The Netherlands, quotas were promulgated for the number of packagings single customers could buy at one time. Then the gods punished the foreign suppliers for their hubris. Fonterra came with the news that of its whey powder could have been contaminated with botulism. That shocked China. The Chinese authorities grabbed the momentum of the falling consumer confidence in foreign formulae to start a media campaign trying to restore the reputation of domestic product. To support this, they launched an investigation into monopolistic activities by foreign suppliers of infant formulae. Most of them were found guilty, and those who have not fully cooperated with the investigation, were heavily penalized. The most recent problem are the accusations against Danone that it had bribed hospital staff to feed babies first with their Dumex formula, to get them hooked on that brand. Yesterday, a news item in the Chinese media reporting about a survey among young parents noted that the latter are still more confident in foreign formulae. Who are the guilty parties here then? I believe all of them. The domestic suppliers have forfeited their favourite position with relatively low cost to produce good, generic perhaps, but good, infant formulae. The foreigners have been too greedy. The constant price hikes increased the financial burden for young parents. Without those unreasonable price increases the authorities would probably have left their high market shares untouched. The peculiar contamination incident at Fonterra was the dead blow for the reputation of imported formulae. It is not only something a market leader should never let escape attention, the time elapsed between the first signals about possible contamination and the publication by Fonterra was measures in months. Chinese companies like Sanlu were heavily criticized in the Western press for at first trying to hide the first reports about health problems, not to spoil the national Olympic party. The same media were a lot milder towards Fonterra. The Dairy Association of China (DAC) has begun to promulgate ‘state endorsed milk powder manufacturers’. Here, ‘milk powder’ mainly refers to infant formulae. 12 have so far been stamped this way. Others are allowed to produce as well, but the state guarantees the quality of the suppliers on its shortlist. It will surprise no one that China’s top dairy company Yili (see the item on China’s top brands of 2014) heads the list. The best that can come out of this mess is that there now is finally an opportunity that the Chinese market for infant formulae becomes a level playing field in which domestic and foreign brands can compete fairly. The latest measure, promulgated in January 2016, is that infant formula makers are not allowed to be active in China with more than 3 brands or 9 different products. The first victims of the new playing field (level or not) have already presented themselves. Yashili International Holdings Ltd the Dumex infant milk formula unit from Danone SA in July 2015. Yashili is 25% by Danone and one of China’s top 10 infant formula makers by sales. Financial terms weren’t disclosed, but Danone will use proceeds to buy shares in milk producer China Mengniu Dairy, which owns an indirect 51.04% stake in Yashili. Recent statistics seem to confirm that it works. China has imported 78,893 mt of infant formulae during the first 8 months of 2014. This is happening in spite of recurrent media reports about batches of imported infant formulae being rejected by the Customs inspections. A number of international players try circumvent those problems at the customs through setting up local production. FrieslandCampina of the Netherlands entered into a joint venture with Huishan Dairy (Liaoning) to jointly produced infant formulae in October 2014. The joint venture will own Huishan’s facility in Xiushui (Liaoning). During the obligatory ceremony, the Dutch partner’s CEO said that he was ‘proud that FrieslandCampina will be part of the first joint venture between a Chinese and a foreign dairy company that will locally source, manufacture, market and distribute infant milk formula’. That statement called for correction, as a number of international investors have preceded FrieslandCampina, with varying results. A few years later, mid 2017 to be precise, the joint venture got into serious problems, when the Chinese partner Huishan was accused of fraud. FrieslandCampina opted to buy out their local partner early 2018 and now operate a wholly foreign owned company alongside their partner. This situation is far from ideal, as it renders FrieslandCampina’s local production in China extremely vulnerable. Later that same month October 2014, Danone announced that it was to subscribe to a private placement by Yashili, one of China’s leading infant milk companies. Upon completion of the subscription, Mengniu, currently Yashili’s majority shareholder, will hold a 51.0% equity interest and Danone will hold 25.0%. Danone and Mengniu want to use this expanded alliance to grow Yashili and develop a wide range of products that meet the very highest standards in this category. Through their alliance, Danone, Mengniu and Yashili intend to expand and strengthen their cooperation in the infant milk formula business in China. The parties will study the possibility of a minority equity investment by Yashili in Danone’s subsidiary Dumex China. A number of Chinese companies try to overcome the problems in the industry by acquiring foreign infant formula producers. Formulae imported from those plants then have a hybrid Chinese and foreign identity. Bright Dairy & Food (Shanghai), China’s third-biggest dairy company by volume, has bought a majority stake in Canterbury milk processor Synlait Milk for $82 million in 2010. Synlait, which abandoned a planned $150 million share sale in 2009 due to a tepid response, is a joint owner of its processing company with Bright Dairy, while keeping and operating its farms through a separate company. In 2014, Bright bought a majority stake in the Israeli manufacturer of infant formulae Tnuva. September 2014, Guangdong real estate group Evergrande (which also owns the province’s main football team) acquired the New Zealand company Cowala Dairy. 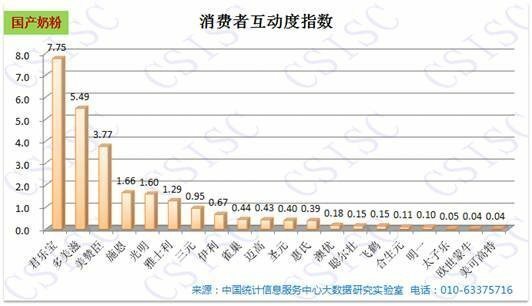 An interesting development is that the China Statistical Information Service Centre (CSISC) has started analysing online consumer interaction about brands. CSISC published the following table showing consumer interaction about infant formulae in the 2nd quarter of 2014 today (19/9/2014). The brand most discussed is Junlebao (also featuring in my blog on old yoghurt), followed by Dumex and Mead Johnson. The brands that the central government has been heavily supporting in the above described campaign, like Yili, ranks 7. Obviously, brands can also turn up high in this graph, because consumers may share negative experience with it. Still, CSISC analysts believe that this outcome shows that newcomer Junlebao’s low price strategy is reaping results. Junlebao received class A certification of EU’s BRC Food Safety Global Standards in September 2014. Junlebao’s milk powder would be qualified to enter CIES’ 200 supermarket groups in the world. I would like to add that it also proves the central authorities right: the Chinese market for infant formulae is a level playing field now. The international brands are still favourites, but local entrepreneurs have ample space to move, as long as the get their strategy right. In spite of all the attempts to invigorate the domestic industry, imported formulae remain strong. The following the table shows the development of those import in the past few years. Here is the list of top imported formulae of 2016 as published on a major Chinese food site. More babies, bigger market . . or not? The market for infant formulae has changed in China, when the government decided that couples who both were only children were aloud to have 2 children. Even though fewer eligible couples responded positively than expected during the first few years after the decision, this is now gradually leading to a small baby boom. That and the continuing growth of an affluent middle class, has boosted the sales of most players in this market. However, this does not mean that China will once more become the paradise of multinationals in this field. It is a genuine level playing field now, and a growing one, with opportunities for all companies that are willing to play by the rules. However, in spite of the new policy, 15.23 mln babies were born in China in 2018, 2 mln fewer than in 2017. Therefore, insiders estimate that the consumption of infant formulae in 2019 will be approximately the same as in 2018, and will decrease with 2% in 2020. This entry was posted in Uncategorized and tagged A2, Abbott, Aptamil, Babybio, Bellamy's organic, China infant formulae, Dairy Association of China DAC, Hipp, Junlebao, Karicase, Nutrilon, Wyeth, Yili by eurasiaconsult. Bookmark the permalink. page. I know one awesome method of earning money, I think you will like it.